Prior to 1936, Brooklyn’s Sunset Park had a hilltop pond that was used for ice skating. The mystery here is whether Sunset Park Pond was natural or manmade. Let’s examine its history. In the course of the city’s development, expansive rectangular grids were laid out across the landscape, but in certain places where the topography was too difficult for streets to pass through, the city established parks. In Manhattan such examples include Morningside, St. Nicholas, and Jackie Robinson Parks, which follow an escarpment stretching between 110th and 155th Streets. Brooklyn, at the time a separate city, established parks on exceedingly steep hilltops to allow for scenic vistas. 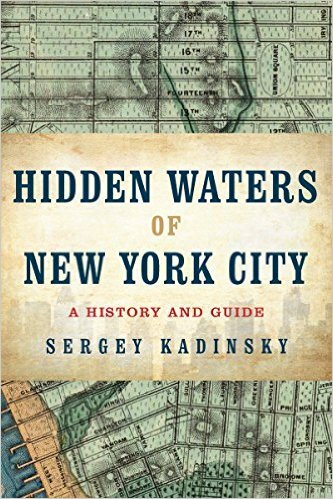 Such examples include Fort Greene Park in 1845 and the 14-acre Sunset Park in 1891. The views offered by Sunset Park are unmatched, with a line of sight extending to the Watchung Mountains of New Jersey, downtown Manhattan and most of Brooklyn. In 1647, Norwegian-born settler Hans Hansen Bergen settled in the Wallabout Bay section of Brooklyn and his descendants later acquired properties in what became Sunset Park. The terrain was comprised of a steep slope on the west that descended towards the harbor and the terminal moraine on the east that was part of a ridge stretching the length of Long Island. Kettle ponds formed in the wake of the last ice age were sprinkled along the ridge. Most of them did not have names nor appeared on maps. As the photo of the week shows, Sunset Park once had a pond. Was it natural or manmade? Two blocks to the north of Sunset Park is Green-Wood Cemetery, which also sits atop the terminal moraine. It had seven kettle ponds within its borders when it opened for burials in 1836. As burial space was dwindling, some of the ponds were filled and only four remain today. Looking at the July 7, 1892 article on the left from the Brooklyn Daily Eagle, we read about two ponds in the park which will be replaced by “a couple of miniature lakes.” At the same time, the August 5, 1892 article on the right from the New York Times goes into detail on the views afforded by the 200-foot hilltop, but no word on any ponds or lakes. Looking again at property maps from the years preceding the acquisition of the park property and the rarity of lakes on the summits of hills in the region, it is easier to say that the lake was carved out of the summit during the construction of the park. During its four decades of existence, the pond was used for ice skating and boating. The concession for boating was given to an individual named Hoaare, who stored the rowboats on Joe Hartley’s property at Sixth Avenue and 45th Street. The boats remained in the yard long after the pond was drained. In the Brooklyn Daily Eagle, two readers reminisced in late 1942 about the Hartleys, with reader R. R. also mentioning the fish species that lived in the pond. below, a photo of the pond from the Brooklyn Public Library collection shows a model sailboat plying its water. For most of its years, the pond had a fence around it. The photo below is undated. Along with the pond, the park also had a six hole golf course, neoclassical design shelter and a carousel. In the 1924 aerial of Sunset Park, the layout is Olmstedian with winding trails traversing the park. In a contemporary aerial, nearly half of the park has been redesigned for active sports that includes a playground, sports field and recreation center with an Olympic-size pool. A Depression-period work of architecture, it opened on July 20, 1936 as the sixth in a series of a dozen pools citywide that opened during that decade as part of a larger federally-funded public works project. Behind the landmarked Art Deco style recreation center and pool, a concrete playing field was given artificial turf in 2013, enabling a larger variety of sports to be played. Where children once ice skated, they can kick soccer balls, hit a home run or hike a football. When in doubt, rely on the 1891 Joseph Rudolf Bien map for the answer on Sunset Park Pond. On the map above, the terminal moraine runs diagonally between Prospect Park on the northeast and Bay Ridge on the southeast. The neighborhoods of Kensington and Parkville are on the gently sloping outwash plain. To the south of Green-Wood Cemetery, four kettle ponds are marked, but none within the borders of Sunset Park. Referring back to the 1892 Brooklyn Daily Eagle‘s mention of two ponds, we see that there were two ponds on the park’s border. Looking at the map, none of the surrounding hilltops have ponds on their summits. It is safe to presume that the pond inside Sunset Park was indeed artificial. As it was with Central Park, in its early years Sunset Park had few trees. It took a couple of decades for them to mature and give the park a more verdant appearance. The park lends its name to the surrounding neighborhood, which was once populated by German, Polish, and Scandinavian immigrants, but these days mainly by newcomers from Mexico and China, and artists displaced from neighborhoods further north. With the entire borough facing gentrification, the fear of glass-box high-rises disrupting views of Manhattan ad the harbor is very real, and the Sunset Park Landmarks Committee is fighting to preserve the sight lines from this park and Green-Wood Cemetery. The local weekly, Home Reporter and Sunset News, also reports on the uphill battle to preserve the neighborhood. (pun intended). Since 2011, my source on neighborhood news has been my journalism school classmate Heather J. Chin. Truly among the more intelligent neighborhood writers, her social media is peppered with thoughtful articles on the neighborhood, Asian-American culture and local politics. More recently, she hopped off from Sunset Park to another hilltop neighborhood. She now writes for the online news site Fort Greene Focus. At 42.5 acres, Sunset Park is an oasis in an otherwise dense neighborhood with few parks in between. It still has its panoramic views, winding trails, playground, sports field, pool, but the pond is a distant memory. The recently completed Bush Terminal Park now serves as the neighborhood’s second large park, located on the waterfront. In case you missed it: digital mapmaker Chris Whong just released Urban Scratch-Off, an interactive map tool that reveals the city’s past with a click.